All the practical information you need to know about Wollemi National Park. There are lots of great things waiting for you in Wollemi National Park. Here are some of the highlights. With its softer light, autumn is the perfect time of year to head out to photograph or paint Wollemi's extraordinary landscapes. With the temperature warming up, dig out the canoe and head to picturesque Ganguddy (Dunns swamp) for a cruise along the waterways. Escape the heat and join an illuminating tour of the Glow Worm tunnel. South-west section (entering from around Lithgow, Newnes, Bell, Mount Wilson): contact our Blackheath office. Hassans Walls Lookout, near Lithgow, is the highest in the Blue Mountains. Admire Mt Wilson, Mt York, Mt Tarana and Mt Blaxland as well as the pretty Hartley Valley below. To the south are the Kanimbla and Megalong valley and Mt Bindo. While there, go for a walk or ride around the lookout. The magnificent Govetts Leap waterfall drops a whopping 180m to the base of the cliff. The 'ozone-laden' air of the Blue Mountains was promoted as a health tonic since the early 1800s, and when you get there, you'll realise why. 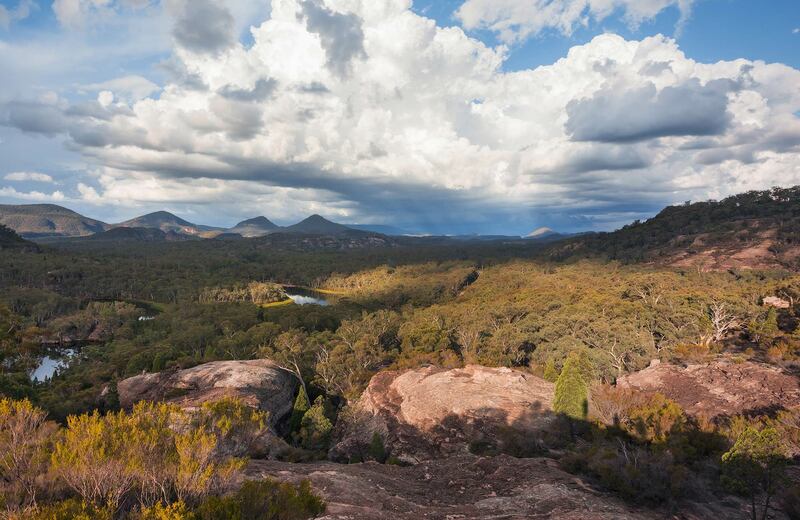 Kandos is a gateway to the wonderland of Wollemi National Park, the rugged home of one of the rarest plants in the world - the Wollemi Pine - and other endangered and threatened species of plants, marsupials and birds. It's a great base for bushwalking, water sports and enjoying the great outdoors.